Can the Tech Oligarchs become good guys again? Two bad days in Congress didn’t scare Mark Zuckerberg into a profound spiritual and religious conversion. He has not renounced the material world. Zuckerberg seems to be the same smugly poised $64 billionaire that he was before Facebook had its month from hell. Still, although I spend a lot of time fretting about monopolistic technology platforms, I have to admit I was rooting for Zuckerberg during his testimony. Many of the Congressmen were not too bright — I managed to catch the portion of the testimony where one representative was harping on a conspiracy theory fomented by his brother-in-law about how Facebook spies on cell phone calls and hears everything you say. For much of the Internet era, the tech founders have seemed like good guys. Zuckerberg, Bezos, Brin and Page and the other New American Oligarchs somehow don’t have the same taint that lingers on other US Oligarchs — Wall Street executives, the Koch Brothers or the sort of businessmen who have taken jobs in the Trump Administration. Part of it may be generational commonality. I hate to admit that I’m older than the new oligarchs, but there is a cultural connection that derives from the 1960s values that fed into the Silicon Valley sensibility. So I’m going to like someone who wears at-shirts, espouses vaguely countercultural opinions, and who produces cool, society-transformational products that are free of upfront charges. But proving that it’s possible to not wear a tie and to be rich at the same time is not enough to make you a good guy forever. Facebook’s Cambridge Analytica scandal sparked a broader rethinking of tech monopoly power. Now suddenly the tech founders are seen as profit-maximizing mega billionaires, with a not-so-great new image as Robber Barons of the new Gilded Age. Is it possible that this new round of bad press, this big reputational hit, might induce the billionaire oligarchs of high tech to realize that they have violated their own founding principles? Is it too much to hope that they could commit to an innovative and public- spirited reengineering of the monopolistic tech platforms that they own and run? Can the billionaire oligarchs turn back into good guys? Can they validate the faith in their coolness and essential righteousness? A restoration of coolness is not impossible. The Tech Oligarchs are, after all, very smart, and if they were to put their minds to the task of coolness and righteousness restoration, they could likely achieve it. It’s not as if the Carnegies, Rockefellers and Morgans offer nothing as a precedent. They created enduring philanthropic institutions, to the point — I think — where the good they’ve done is starting to overshadow their depredations. To follow in the Robber Baron mode, the digital billionaire founders would focus more on philanthropy, and start giving away a lot more money and building up their private foundations. Bill Gates has obviously set a strong example — tech benefactors could also learn from George Soros and Warren Buffet. But doing good deeds does not address the immediate issues posed by the technoempires. Their hugeness and breadth, and their economic and political power may be squelching competition, reducing innovation and suppressing opportunities for new startups. Similarly, the highly concentrated tech industry may be contributing to slow income growth and rising inequality. And on a deeper cultural level, the arrogant and unfettered accumulation of power has fostered resentment of the elites and stoked populism. One path that would go beyond traditional philanthropic giveback would be to explore and invent new forms of corporate organization that would embrace values other than pure profit-maximization and “shareholder value.” Imagine a Facebook that voluntarily initiates new privacy policies and media guidelines, or that voluntarily refrains from major acquisitions that would limit competition, or that even spins off WhatsApp and Instagram? Similarly, what if Google were to jump ahead of European privacy and antitrust regulators with its own forward-thinking reforms, or by spinning off Android, YouTube and a major part of its digital advertising division? Amazon could also downsize itself significantly by spinning off Amazon Web Services or its streaming and content business — or perhaps contemplate a voluntary move to pay its warehouse workers more and improve their working conditions. I know very little about corporate governance, so I’m speculating wildly here. Should the tech companies not at least diversify their boards of directors, giving weight to directors who would advocate for public interest over “shareholder value”? I think that’s been tried in Europe — with union representation on corporate boards — and is at least pursued to some extent here when do gooders are appointed to boards (which usually seems like tokenism). Going beyond that, is there any possibility of a shift to a fundamentally different ownership form — public-interest-based ownership wherein the largest block of shareholders would prioritize societal interests over pure profit maximization? In some firms, large numbers of controlling shares are controlled by philanthropies created by the firm founders, so there is some precedent for it. Another approach was recently proposed in a paper by economists Luigi Zingales and Oliver Hart, who argued that “shareholder welfare” should take precedence over “shareholder value.” They proposed that the best route to “shareholder welfare” would be to give significantly more sway to shareholder voting as a means for determining corporate policies. Some of the founders are certainly in a strong position to innovate in corporate structure governance. Zuckerberg owns 60% of Facebook and controls 70% of the voting shares. Larry Page, Sergey Brin and Eric Schmidt control over 60 percent of the voting shares of Alphabet/Google. Bezos owns 16% of Amazon (although in his case, he has not retained special shares which endow him with majority voting control). If a call to the greater good doesn’t inspire the Tech Oligarchs to follow a new corporate path, perhaps the threat of regulation will. In the wake of the Facebook hearings, talk of new regulations has proliferated. It’s seeped into the evolving Democratic Party platform. Trump would certainly love to deploy antitrust regulation against Amazon as a way to lash out at the Washington Post. With Google controlling almost all search engine traffic, Facebook controlling almost all social network advertising and Amazon gaining bigger shares of ecommerce, they are starting to see like public utilities. So perhaps the fear of becoming another Con Ed will inspire Zuckerberg to make a bold initiative to reinvent the idea of the technology corporation. While the Tech Oligarchs have that t-shirt cool factor going for them, some are also said to harbor Darwinian, extremist libertarian tendencies that do not quite line up with the more collectivist bent of the counterculture. Larry Page reportedly said that the world would be better served if he gave his billions to Elon Musk to invest in space exploration, rather than to some run of the mill foundation trying to stamp out a tropical disease. 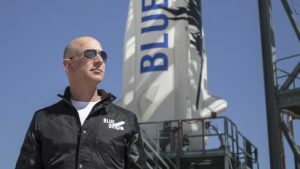 Bezos recently got knocked for expressing the same fondness for his own space missions in preference to charity. But it’s only recently that observers have started to fret about Ayn Rand’s influence on Silicon Valley. The past few decades have been an extended, hopeful period of techno-optimism, years where it seemed that the new generation of technology founders would substantially rewrite the Robber Barron narrative — and not simply become rich, gain power and then abandon their initial idealistic goals. Or perhaps they can redeem themselves by handing out free tickets to Mars for every man, woman and child on the planet.